Want to study a postgraduate degree but can't study full time? Why not consider doing a part-time course instead? Siobhan is a part-time masters student from University of Bedfordshire studying Intercultural Communication. In this video she explains what it's been like, and shares her advice for anyone thinking of doing the same. Ready to find a part-time postgraduate course? 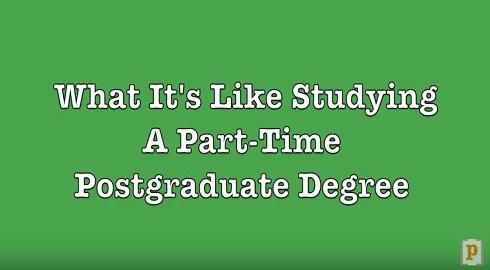 What Is It Like Being a Part-Time Postgraduate Student? Want to study a postgraduate degree but can't study full time? Why not consider doing a part-time course instead? Siobhan is a part-time masters student from University of Bedfordshire studying Intercultural Communication. In this video she explains what it's been like, and shares her advice for anyone thinking of doing the same. Ready to find a part-time postgraduate course?